We wake up groggy, heads still pounding with the bass that shook the Grand Hotel’s ballroom until 2 a.m. last night. Tom and I didn’t really know what to expect when we signed up for a press trip to Snowbombing Canada, but after four days experiencing the rowdy, snow-covered festival, we have a much better idea what it’s all about. Snowbombing Canada is an epic winter music festival transported to North America from the Austrian Alps. From April 5th to 9th, EDM music, fresh powder and dancing ravers in onesies and home-made light-up costumes took over Sun Peaks Resort near Kamloops, B.C. Sponsored by Coors Light, the festival was well-organized and didn’t feel like a drunken summer rodeo, but more like a spaced-out concert with almost exclusively mellow electronic music. I’d snowboarded at Sun Peaks before, but being at the hill for Snowbombing was a totally different experience. Red and blue banners hung in the streets; riders walked around in old-school neon ski gear. While some participants seemed to have come for the pow (and free ride and slush cup competitions), others admitted they’d never been skiing or snowboarding before, and were really there for the DJs. 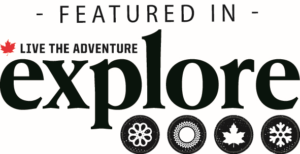 Tom and I were there for explore magazine and Canadian Traveller. We partied at DJs stages, shredded fresh pow and relaxed in the steaming outdoor hot tubs at the Grand Hotel. Even though there were 4,000 tickets sold, the resort didn’t feel overcrowded or disrespected—and the hill itself was practically empty. 9 a.m. – Wake up in our King Executive Suite at the Grand Hotel and get ready for the day. 10 a.m. – Grab a coffee and a bacon, cheese and egg breakfast sandwich at Tod Mountain Café. Devour them. 11 a.m. – Find our way to a yoga mat for Snowga. Stretch through sun salutations in a gentle flow class led by instructor Kaitlyn. 12 p.m. – Make our way to the Sundance, Sun Burst or Morrisey lift. Shred heavy snow in excellent spring skiing conditions. 2 p.m. – Stop for a Strongbow and dance to DJs outside on the Sundance Terrace, surrounded by other skiers and snowboarders right on the hill. 4 p.m. – Make our way down the steep slopes to Coors Light Basecamp, where people are dancing to DJs, warming up at firepits and playing giant beer pong. 6 p.m. – Dine on freshly prepared sushi at Oya Japanese Restaurant or munch on the chicken club at Mantles in the basement of the Grand Hotel. 8 p.m. – Cross the muddy parking lot to the Forest Stage, where ravers holding signs and blow-up dolls are dancing to their own beat. 9 p.m. – Warm up in one of three hot tubs at the Grand Hotel, where drinking (alcohol) from plastic cups is allowed. 12 a.m. – Venture into the Cave in the Grand Hotel’s ballroom to dance to more upbeat DJs and rappers. 2 a.m. – Go back to bed to get a solid seven-hour sleep before waking up and doing it all again. As wild as Snowbombing was, we were able to make it our own. Some participants chose to ski and partake in entertainment events, while others slept all day and partied all night. We found a balance between a wild weekend and a serious snowboarding trip by nursing just a few beers and only spending a few hours each day on the hill. We dressed up in our onesies and I even got glitter smeared across my cheeks, but we definitely weren’t the rowdiest partiers at any of the venues. And to be honest? If I did it all over again, I wouldn’t have done it any other way.